Hello. Welcome to my podcast. My name is Dee and I am the Introverted Advocate. The mission of my podcast is simply this, to create a kinder, more compassionate world through advocacy. I began advocating back in 2014 and I have a few stories I’d like to share. Advocating is like an adventure and it can be done from the comfort of your keyboard at home or it could be an adventure of meeting new people, learning new skills, or finding out that the world is full of caring individuals who are ready to lend a hand, or their heart, when they see a need. I invite you to look around in your world and see who might need a little support and kindness. It could be one individual, it could be a group or a cause, it could be a community. Are you ready? Alright, let’s get to it. Howdy, everyone. Today is December 19, 2018, and I have a couple of days off so I’m going through my audio recordings from my September trip to Catskill Animal Sanctuary. This recording is probably one of my favorites. It’s less than five minutes long and I will apologize now because I was a rookie podcaster this year and I learned the hard way that when you have a really sensitive microphone on this nice recorder, audio recorder, that the wind when you’re outside … So I know how to correct that now. I bought one of these fuzzy things that you put on top of the microphone so I apologize, there’s just a little of wind noise, it’s a little bit distracting, but this is a really funny five minutes. It’s called Meet the Sheep and if you go to my blog, you will see the photograph, it’s actually one of my favorite photographs that I captured of this family of sheep. There were so many amazing moments during my stay, my four days there at the homestead, which was right on their property, that afforded me the opportunity to walk down the hill just a couple of hundred feet and be on the sanctuary property. Basically, I lived there for four days and it was just an extraordinary experience. There were so many little moments, and I will share those in the next weeks as I go through my different recordings that I have here, but I want to put a shout out to Christopher the sheep, because Christopher was born on Christmas Eve just two years ago in 2016. Christopher, I noticed him the first day I was there but he’s a bit shy. I didn’t know this until after I left and then the folks at Catskill told me, “Yeah, Christopher’s shy. He’s only coming out of his shell recently.” That makes sense to me because my last morning there, Sunday morning, I am down by the main barn and I saw Christopher. He’s a very handsome fellow, and he was standing about 30 feet away and so I always approached the animals very quietly and just step by step, give them respect for their space, and Christopher stood still on that last morning. He did not leave. He did not move away from me or kind of do a side step and say, “Mmm, maybe later.” He didn’t do that, he stayed where he was, so I continued to approach him and then finally Christopher just stood there and I was able to put my hand on him and tell him thank you for letting me come say goodbye because I was leaving that morning. Many of you that have companion animals, cats and dogs, who maybe you rescued and they were a little bit skittish or afraid the first couple of weeks or even months in your home just because of their back story, then you understand, it sometimes takes animals a little bit of time to get used to their new surroundings. Now that I know that Christopher was a little bit shy because I think his mom probably came from a not great situation, but Christopher was born there in the barn at Catskill Animal Sanctuary on Christmas Eve. Christopher, I will see you soon. I’m coming back to visit. Okay folks, so let’s go ahead and get this started. It’s about a four and a half minute recording that I took and I’m going to call it Meet the Sheep. Okay, so I’m walking on the gravel lane and there are let’s see, one, two, three, four, five, six, seven, eight, nine, ten, ten sheep kind of trotting, not jogging, kind of doing a little fast power walk headed my way and they won’t stop. They have their destination but I’m going to sit here at the picnic bench and just watch them. I see some stopped by the pond for a snack to graze on the nice fresh grass. We got four others, five others now walking in a row like ducks. Oh, that is so surreal. No really, you’re sitting here at a sanctuary and down the lane comes this big family of sheep. 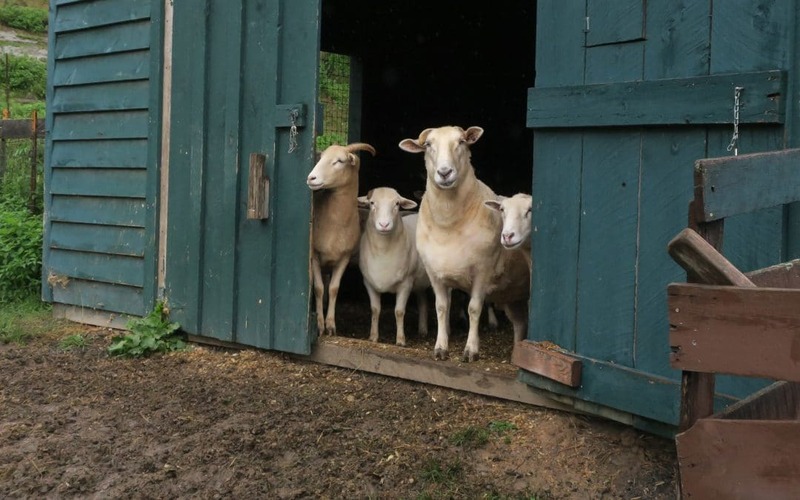 They’re not all related but they’re family now because when you live at Catskill Animal Sanctuary you’re part of one big family, diverse family. Some of the animal residents have pretty severe medical issues that need attended to. Oh, there’s a turkey kind of chirping over there. But all of these animals are just happy, and the ones that are grumpy, that’s just their personality because animals are like people in all the ways that matter. They have emotions and personalities. They have their own intellect, their own way of solving problems, and some of these animals here at the sanctuary are pretty smart at figuring out things and how to get extra food and how to hop up on the pickup truck and eat some hay while nobody’s watching. This place is as funny as it is serene and it’s as lively as it is peaceful. It’s located in New York State, Catskill Animal Sanctuary. This is my first trip here but I want to book another trip for the spring. What an amazing place. Okay, talk to you later. Bye. Thank you for listening to my podcast where kindness is the theme and advocacy is the action. Until next time, this is Dee, the Introverted Advocate.